Yesterday, I’ve visited the famous Jade Temple Buddha located in Jing’an district in Shanghai. 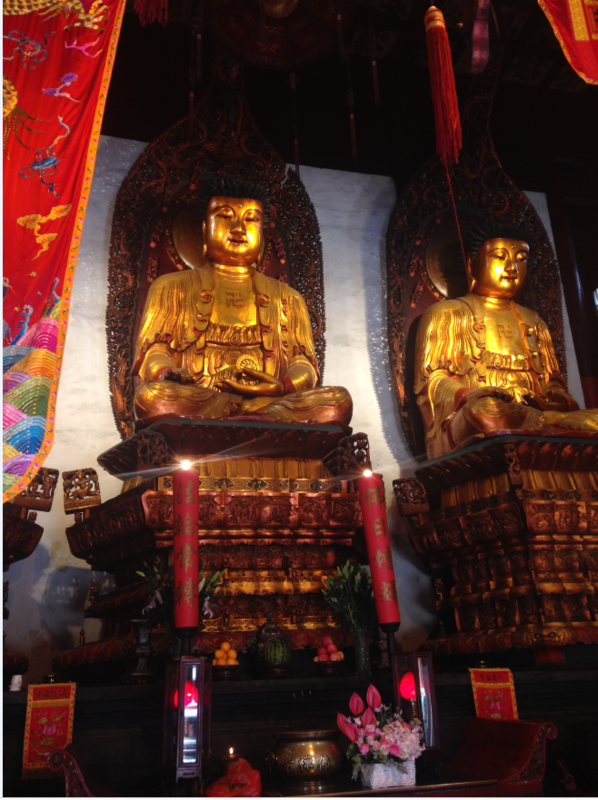 This temple built between 1918 and 1928, is one of the Shanghai few active Buddhist monasteries. The master piece is a magnificent Buddha crafted from pure jade, returned to China with four other statues of Buddha by the monk Hui Gen at the turn of the 20th century, after a pilgrimage from Buddhist island of Putuoshan to Burma through Tibet. In February, during the Chinese Lunar New Year, the temple is very busy, about 20,000 Buddhists come here to pray for prosperity. 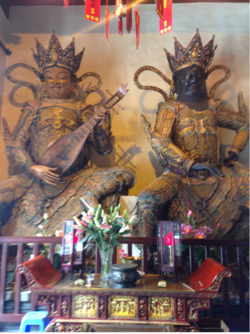 The Chamber of Heavenly Kings is composed of four large statues of the kings of growth, knowledge, omnipotence and protection. This room also contains a beautiful statue of a laughing buddha back to back with the statue of Weituo, the guardian of Buddhism. The first courtyard, decorated with red lanterns and slabs engraved with lotus flowers, leads to the hall of great treasure also called Great Hall. 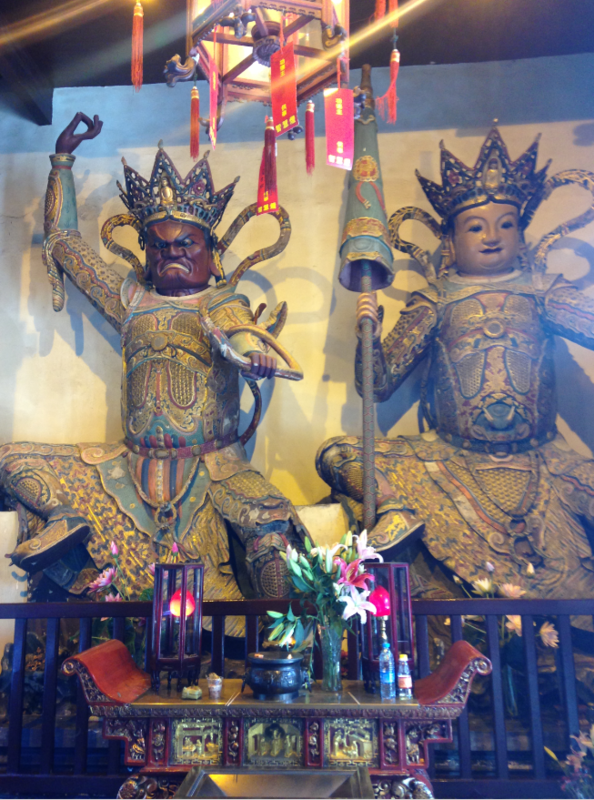 The faithful pray here the Buddha of past, present and future, who are seated on thrones beautifully sculpted. The main room also contains 18 unique golden arhats stand in two groups of nine and also the bell and the drum of the temple. The Jade Buddha Chamber contains the master piece of the temple, a splendid pale green jade Buddha of 1,9m. Unfortunately we cannot approach the sculpture. Even if it’s the master piece of the temple I’ve found the four Heavenly Kings much more impressive. 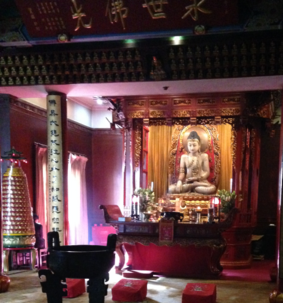 In the ancestral hall there is a reclining Jade Buddha and next to this room we can find the room that welcomes Buddhist offices. I had the chance to attend a Buddhist ceremony with monks and many faithful, this was really interesting and its give me a complete change of scene! Good article! Can you introduce more information about Chinese Buddha statues? I really like Chinese Buddhist art and culture!